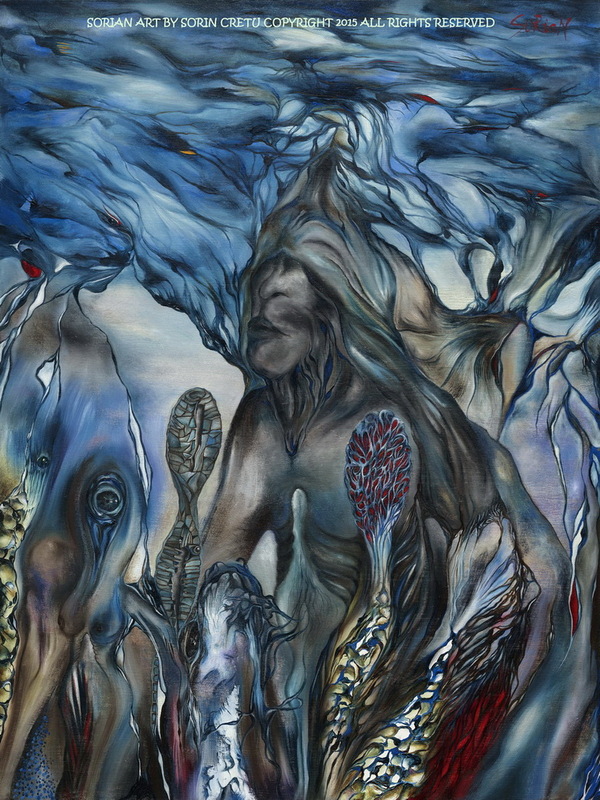 As a painter, Sorin's focus is into the conceptual, the visionary, the surreal. Archetypes, ideas, metaphors of this world and the vastness of the soul are the seeds and the pillars of the stories that he is telling in his paintings. They demand the participation ofthe observer, to dive inside them, to embrace them in order to eyewitness this emerging new world. Various psychological and philosophical concepts are woven together in the compositions unveiled from each painting, inviting the beholder to decipher, comprehend and re-evaluate his own point of view in order to givean authentic expression to the meaning the liberation, the love, the fear, the angst, the anger has in each one of them. His art concept combines the beholder's immersion into archetypal ideas, through highly detailed paintings, with a firm representational structure, backed-up by his own philosophical explicative stories of the respective compositions and sets of ideas. The underlying stories are all linked at a deeper level and connected with his philosophical poetry. His goal is to attain through highly detailed surrealist representations the fundamental simplicity and in the same time the complexity that would keep the spectator in place, challenging that person to discover the painting, to find its story and how that relates to their context. His painting and his poetry are in search of the liberated seeker, with the depth, the sharpness and the honesty of the un-imprisoned thought, igniting the worldly egos, the selves and the gods into a new kind of awareness and perception. They are to illuminate our darkest and dearest of nights, the night of time, with his candor, grasping at every slice of light and life, until the day of our awakening. His art is about what seems to be in our sight, but mostly hides at the edge of our eye, it is about the truth in our un-admitted lies and the freedom we silently crave for in the shadow of our defeats. It is about the presence, about the now and here in everything and the endurance to walk this path. His art lives within himself and he is his own art even before calling it into realization. Being his art means to be free; doing his art means to share it with the world, to be in communion with it, to openly communicate with the universe and allow it within. His art is the very statement of liberation in the world, which cannot be pursued without the Other. In the stories he is telling in his paintings and in the verses of his poems, we glimpse at the healing light of the self, striving to detach from the supremacy of the ego, from the continuous chain of its worldly attachments. His art is the guiding path into this higher and more, it is the living into the state of getting closer to the finality of our questions, it is the act of not walking away and turning the back to our battles, our turmoil and our dreams. Through the immersion in it, his art has the power to bring you back to living. You are all invited to fully participate into this new realization of our cosmos. His background in art and philosophy gives to this attempt a distinctive perspective. Through his paintings and his poems, he will be your guide in this new world. 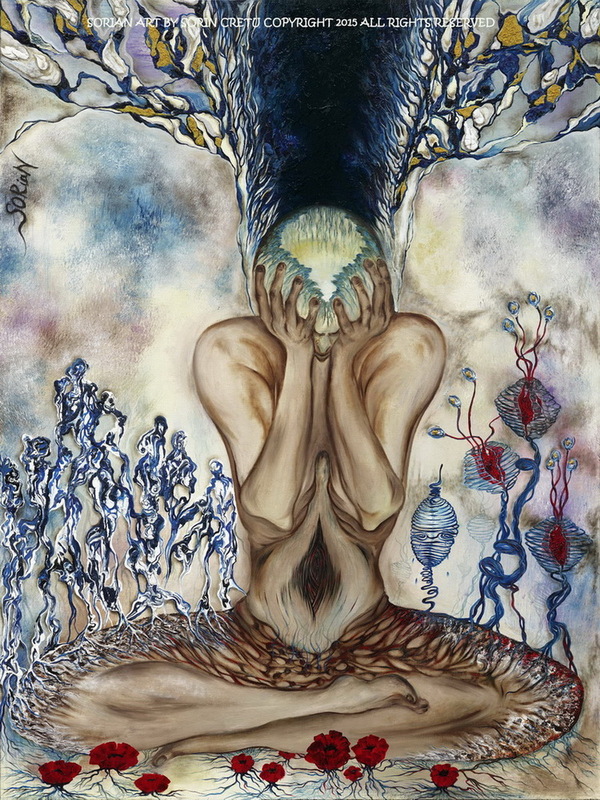 Look again at this world through SORiaN's Art like through a magical crystal and find a new connection with your own intimacy, your prejudices, your shame and guilt, your safe zones and your dark demons lurking behind your precious convenience. Posted on August 16, 2017 by Lory MacDonald.